When many people think of athletic windscreen banners, they picture a plain one-color banner perhaps with simple block lettering across the front. While simplicity can be used to great effect, today’s digital printing technology allows for much more dynamic and detailed designs than was previously possible. Newer windscreen designs often feature vibrant, full-color prints highlighting school colors, logos, energetic text, and background fades and patterns. If you’re considering dressing up your facility in a large, but cost-effective way, take a look at the three featured projects below. 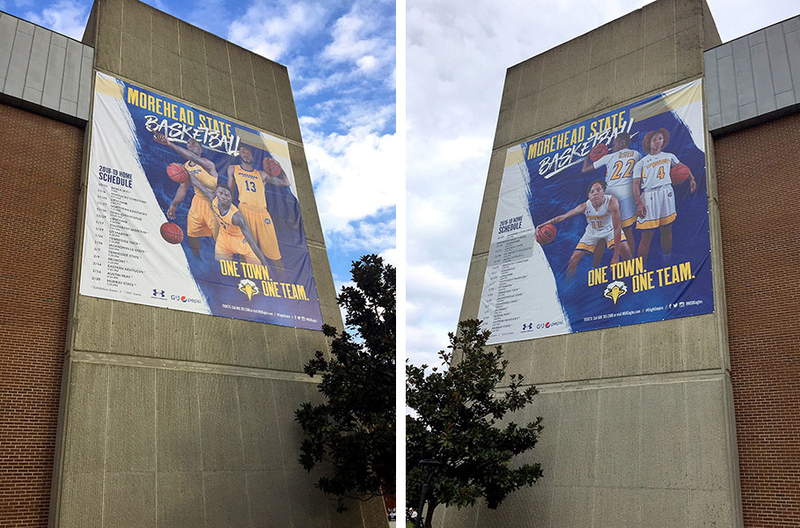 Each project highlights unique designs and ways athletic programs are using windscreen banners on their campuses. Morehead State University in KY approached us looking for a cost-effective way to display the home schedules for multiple sports including football, girls soccer, and boys and girls basketball. The Eagles wanted to feature images of key players along with their home schedule while also staying true to their branding. Windscreen mesh is an ideal material for these oversized banners because it can be produced at any size. Additionally windscreen offers a vivid print quality, installs easily, and is durable enough to last in an outdoor environment. Exterior wall space is often overlooked when looking for places for advertisement. Take a look around your facilities to see if you have wall space available. This type of graphic can be a great way to both support your teams and drive attendance. Outdoor athletic campuses often include a football stadium, soccer fields, tennis courts, baseball fields, practice fields, and more. All these facilities require a lot fencing. While this fencing provides a utilitarian purpose, when standing alone, it often doesn’t do a good job of defining each space and showing the personality of the teams that occupy it. Valley High School in IA was looking for a windscreen that did just this. They wanted to visually close off the area behind the end zone to offer a more enclosed feel in their stadium. The finished design featured oversized text welcoming visitors, a callout to the school mascot, and a list of the teams that play and perform in the stadium. In addition to providing a nice visual backdrop that defines the perimeter of the stadium, there may also be increased ticket sales now that the free view has been obstructed! The softball field at Coral Reef High School in FL is near idyllic. The beautiful ballpark features palm trees planted beyond the outfield fence and the sun is always shining. We were excited to help when they asked us to design an outfield fence windscreen to compliment the view. The sharp color scheme and aggressive Barracuda logo helped make the design come together easily. These elements were accentuated by a dark gray coral reef background pattern flowing across the entire width of the design and contrasting text in the power alleys. Being former baseball players ourselves, we know the importance of keeping centerfield free of any distracting graphics, so that area was left mostly black. The outfield fence of baseball and softball fields are a classic place to display an athletic ballpark windscreen. Perhaps your ball fields could use a visual upgrade, a better definition of space, or simply block out distraction. Windscreens can be an easy upgrade to long expanses of fence line found at on athletic campuses. Windscreens are the most cost-effective way to add serious visual impact to your outdoor spaces. Reach out to one of our reps today for more info or to receive a free design mock up and quote.